I recently discovered this new organic vegan flavor of PranaBar while shopping at Akin’s Natural Foods Market. 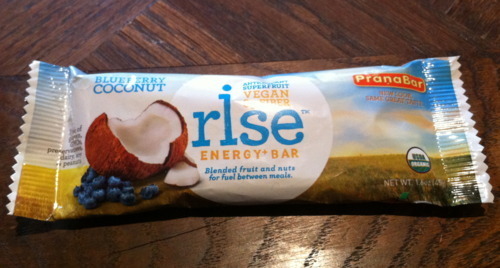 Apparently PranaBars have revamped their look and rebranded themselves, now simply known as Rise Bars. (A much improved change by the way). 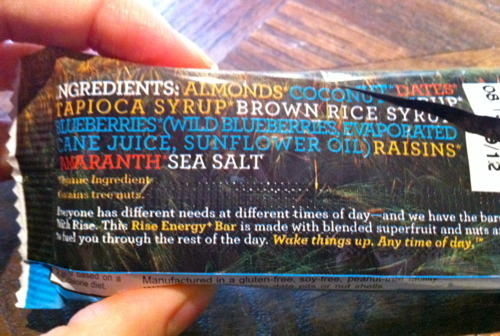 The energy bars come in a variety of flavors, however, I am OBSESSED with the Blueberry Coconut one! Check out the all-organic ingredients: almonds, coconut, dates, tapioca syrup, brown rice syrup, wild blueberries (sweetened with a less processed sweetener), raisins, amaranth, and sea salt. That’s pretty dang healthy for an energy bar that also tastes amazing. IMO the ingredients of “health” bars usually do not taste as good, nor are as healthy as they proclaim to be. In this case, however, Rise Bars prove to be the exception. It’s a pretty filling bar, which also happens to be under 190 calories and packs 3g of fiber. Not too shabby for a snack on the go! Caveat: Please note that I do not believe eating a lot of packaged bars to be necessarily healthy in themselves. But when on-the-run or taking breakfast to work, these are a great option. Much better than SKIPPING breakfast all together anyway (craziness)! Looking forward to making a raw version of these blueberry beauties myself soon!